Whoever said that must have been an RV owner — after all, one of the best things about vacationing in an RV is the fact that your “hotel” is pretty much anywhere you decide to stop. Of course, there’s a little more to finding a great camping spot than just pulling over and hoping for the best, so we at Mosaic Insurance put together some tips and resources to help you find the best spots on your next trip. Just as you would book a hotel before you leave on a vacation, it’s best to make reservations for your RV trip, regardless if you’re staying at a private RV park or a campground on public property. As anyone who has been to Oak Creek Canyon or Flagstaff can tell you, spots fill up quickly during peak travel seasons and often sell out. 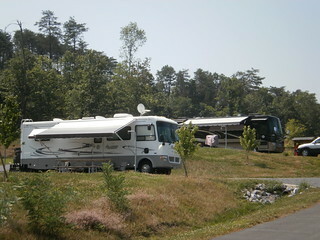 From basic accommodations to luxury RV resorts, you have many choices. State and national parks tend to have simple campgrounds, but they often offer the best in natural beauty! Whether you go public or private, you’ll want to factor in whether the site has hookups for your RV, how much you’re willing to spend and how close you’ll be to attractions you want to visit — particularly if you aren’t towing a separate car and need to use the RV for all of your travel. Some shopping centers and truck stops will allow overnight camping, while rest areas generally prohibit it. Always be certain that you have permission to camp before setting up for the night. Park out of the way. Avoid using slide-outs and awnings if possible. Do not use your leveling jacks on asphalt. Limit your stay to one night and leave the area cleaner than you found it. Purchase fuel, food or supplies as a thank-you when feasible. Do not put personal items, such as chairs or a grill, outside. We know insurance is just about the last thing you want to have on your mind when you’re on vacation, so give us a call at 928-458-7374 before you leave to make sure you’ve got the coverage you need! Here’s to safe travels and happy RVing!